These originated during correspondence with a friend who was planning to brave the world of sushi for the first time. These are not the last word on sushi by any means, but maybe others in the same situation will find some useful tips here. 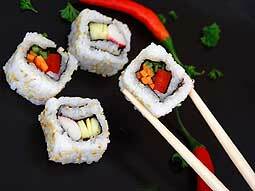 If anyone has more sushi recipes they would like to share with us, please send in your recipe by clicking here. And that's it. Just get those five sounds and you can sound very passably speak like you know what you are talking about! vinegared rice served with pieces of something else - not necessarily raw fish, and not necessarily fish at all. 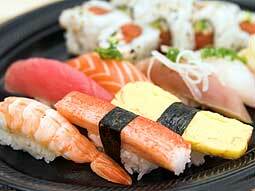 The majority of the times people use the term sushi they are referring to the rice with raw fish, but not always. always means raw fish without the rice. This is a bit subjective on my part but I have had about ywenty-five years of experience. Although these are very popular items, I've just never seen the point to them. They are very chewy with no particular taste at all as the payoff. Pretty much only for the experienced or really adventurous. I've heard uni described as a definitely acquired taste - someone said that it tastes like something that had been sitting in a tidal pool in Puget Sound! If I've ever eaten it, I don't remember! Ah, hamachi! My favorite of all! It means yellowtail. It is possible but probably not likely that you might see it listed as buri or inada. You can get it straight as nigiri-sushi - that is the piece over the rice - or as what might be called negahamachi-maki - that is, hamachi with scallions (which really is a wonderful combination) in a roll of rice wrapped in seaweed. Either way, you cannot go wrong! 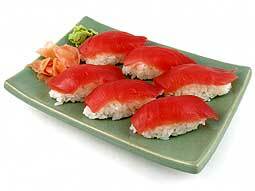 Tuna will be listed as maguro or toro, the latter being a much choicer cut. This will be available on the single nigiri pieces or in the maki rolls. It's nowhere near as big a taste as hamachi but many people, especially beginners, find it very pleasant. I would, however, stay away from anything called a spicy tuna roll. As far as I can figure out, they douse it with tabasco-laced mayonnaise. I don't think that it's exactly authentic, and it will ruin your palate for the rest of the meal anyhow. The fresh salmon is sake (not to be confused with the rice wine sake - the accents are a little different). This is good - very delicate tasting, probably best eaten prior to hamachi. Sushi bars very often will have the smoked variety of salmon also. That will taste more or less like novalox. Many words for the varieties but often grouped under the generic word saba. Now, this mackerel thing is a true mystery to me and I would love to solve it. It seems that there are not only a variety of mackerels, but it can also come in various stages of preparation. When it is good, it rivals the hamachi. But often, I don't care for it at all because it has been pickled or something and then it loses its rawness and tastes more like plain old cooked fish. So, I never know whether to order it or not, because I haven't been able to figure out the right question if it is of the right type or the right condition that it's what I like. As I said, very mysterious. Ikura - if you like caviar, you really must try this! Large red roe that are fun to pop between your teeth. It usually comes in a short, squat tube of seaweed - packed into it with rice on the bottom. It is a bit tricky to eat, as there is no way to make two bites out of it. 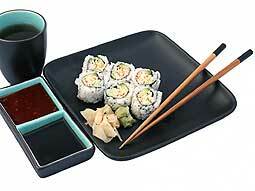 Easier to eat if you can find it in the maki (roll) format but that does not seem to be very popular. There is the smoked salmon that I mentioned. 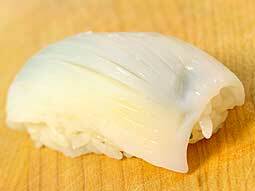 Kani-kamaboko - it is just that salad crab meat that is really pressed, rolled Pollack (cooked). Kappa or kappa-maki in a roll. 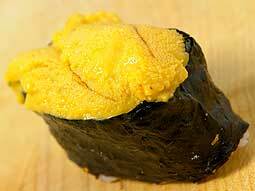 Tamago - comes in little sushi pieces, often wrapped with a strip of seaweed. Most likely not authentic and perhaps a bit declasse to order, it is still very tasty (and good to make at home). 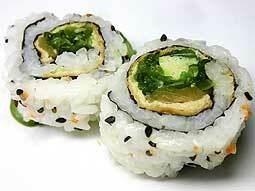 Strips of avocado and faux crab are sprinkled with sesame seeds and wrapped in rice and seaweed. Often it will be rolled up inside out with the rice on the outside and then rolled again in a coating of smelt roe, which makes it very nice to look at, and I like the crunchiness of the smelt roe. 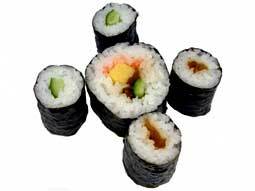 A lot of new-fangled sushi rolls, such as the above, have appeared in recent years . . . often mind-boggling concoctions of individual chefs. 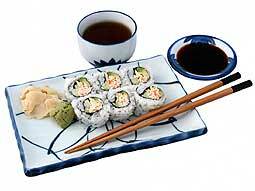 Some have become generic, such as the California Roll, but others are idiosyncratic and often named for cities. At your place will be your own small saucer-like dish (might be round or square or rectangular). The sauce itself will be either in the original commercial bottles or in a very small ceramic pitcher which you will share with one or more other persons. (If the commercial bottles are there, and you have a choice between the regular and low-sodium, choose the low-sodium. Of course, it is healthier but it really does bring out the flavor of the fish better and doesn't drown it in so much salt that you'll be spending the rest of the afternoon at the water cooler). Anyway, pour a small amount in your little dish - enough to soak but not so much that it will slosh. You can always add more later. The actual dipping of the sushi pieces is a matter of many opinions. 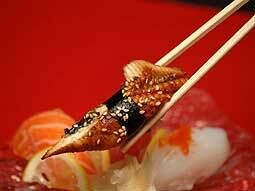 Some people hold that the only way is to allow only the fish part of the piece to touch the soy sauce. For myself, I like to let the rice soak up some of the soy . . . just be careful not to let it do that for too long because then the packed rice will fall apart, and it's kind of icky to have a whole lot of rice grains floating in your soy dish. You might want to watch what some others are doing. This will appear as a clump or mound of green stuff on the dish with the sushi. It is horseradish and usually very hot (although the strength can vary depending on who makes it), so try it only in a very small amount first. 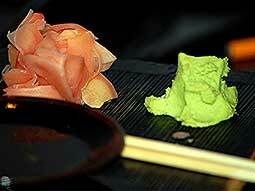 We have been told that it is authentic to put some of the wasabi paste into your soy dish and mix it around. Keep in mind, however, that the chef usually will add a bit of the wasabi himself between the rice and the fish, so you might not need any at all. Probably taste the sushi piece first. If it's already hot enough, forget the wasabi. 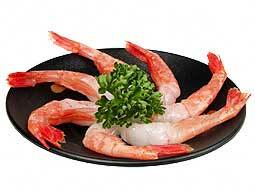 This will appear on the plate with the sushi as a mound of golden or pinkish slices. It is very spicy although not hot in the same way the wasabi is. It generally is NOT to be eaten with the fish, but between sampling the different varieties. The idea is that it clears your palate. It is also wonderful for your stomach! Just use a slice or two whenever you change to a new fish. You might find a few other odds and ends on the plate as garnish - some edible, some not. Obviously, don't eat the little piece of green paper grass! There might be something that looks like a clump of white grass. I think that is just shredded cabbage - probably OK to eat, but not required. Citrus slices also might appear. So that is the condiment basics. I think that all we have left to cover is some odds and ends! They have got diagrams there that show the basics much better than I can explain them. The thing is that even if you've got the basics of it down, sushi still presents some problems. If you get the maki (the rolls) that are cut up in bite-size pieces, that shouldn't be any trouble. The problem comes with the nigiri pieces. These usually are larger than one bite but it's impossible (for me) to get that first bite while holding the remainder of the piece between the chopsticks. And it ain't easy to dip the whole thing in the soy sauce either while holding it in chopsticks. Usually the result is a very large and embarrassing soy sauce splatter! So, I usually give in with nigiri pieces and just pick them up with my fingers. This pretty much is going to depend on your company and whatever the plan is. If feasible, try to order a la carte . . . that way, you can control what you get. If the agenda is such that it is not possible to order a la carte then you will have to settle for ordering a sushi or sashimi sampler plate which usually come in two sizes. If that is what you must do, try to request no squid or octopus (ika or tako). It has been my experience that they always put that on the assorted plates and they are just not worth it. If you do get a sampler plate, ask the wait-person what is what. That way you will know what you like for future reference. I think that is about it . . . This article was written by Leslie Campbell Rampey, Ph.D., M.L.I.S. who was Assistant Librarian for Public Services at Roberts Memorial Library in Middle Georgia College, Cochran, GA. Leslie used to have her own web site but unfortuanetly with the demise of Geocities it has now gone forever. This page remains as a tribute to Leslie Campbell Rampey who was killed with her husband Bryan in a head-on car crash in March 2003.